These days, anyone can make a timeline, covering any scale and on any subject. That’s an enormous and only recently acquired human freedom. Our human timeline is now a universal means of understanding, like the meter or the kilo, and we all have one. 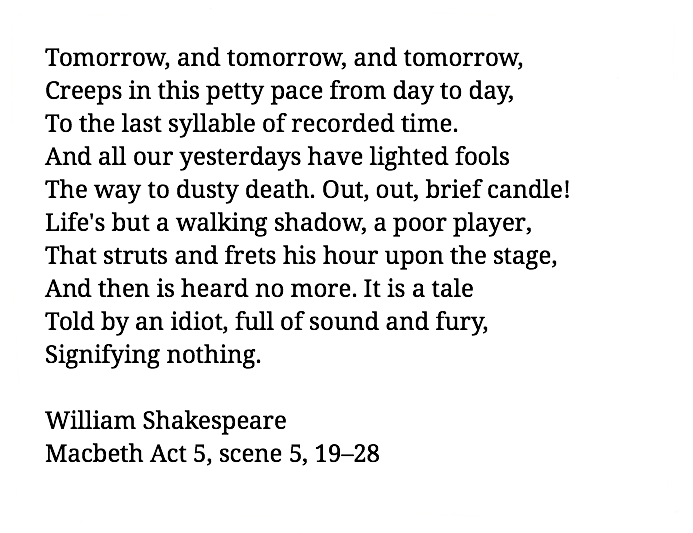 With technology like this, we’ve the ability to step outside the confines of the timelines that have been handed down to us, as mere fools and poor players on the stage as Shakespeare put it. Timelines are a narrative thread, the unifying filament for human stories; a window on human endurance and a chart of the long game. The notion of there being a ‘march of time’ perhaps resonates more than ever now, because technology is relentless. As we charge ahead and digitize our lives, the timeline is the unit of measurement that makes sense of it, gathering and sequencing all the events that have touched us, individually and collectively, moment by moment, day by day, year on year and century after century. Timelines provide a sense of continuity and help express life’s meaning. They can connect us to the essence of ourselves, charting the milestones that have made us great, and mapping the ways we add something to the world. From here on in, the digital timeline of each of our lives will record pretty much all of what we do, from the moment we’re born to the moment we die. The digital timeline is well and truly embedded into our lineage in no small part thanks to Facebook who introduced the timeline as a standard navigational tool in December 2011. With 1.49 billion Facebook users around the world at this point in time, the timeline’s now a standard, universal protocol. 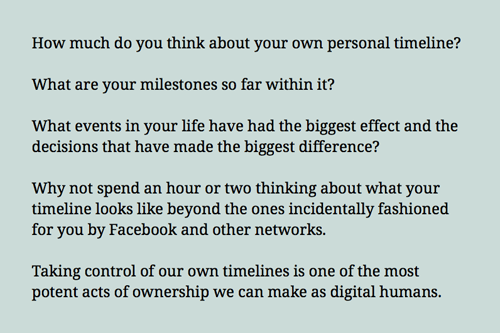 When Mark Zuckerberg changed privacy settings and made ‘open’ the default standard, he helped to establish the timeline as a highly visible, ubiquitous, digital unit of human measurement. Now there’s a good chance your digital timeline will make you more immortal than any of your ancestors. What we each do with life from here on in will be gathered, recorded and fashioned by technology. The digital footprint will be what’s left, the residue and remnants of ourselves in the virtual world that are accessible, long after we’ve departed. The ability to gather and record the world’s information as linked and irreducible data, perpetually and collectively, places us at a moment in history of immense significance. The digital world is ushering in new powers of agency. Algorithms are making decisions for us faster than we can even comprehend. So, consciously thinking about our own timelines can ground us and make sense of where we are. It can act as a safety valve and a compass point amid the deluge of moment-by-moment information we’re all dealing with. We can use timelines to bridge the past and present so the next chapter of civilization becomes manageable and so it can be enduring, consciously and intentionally created as a trajectory of lasting value.